engine from a series of children’s books. 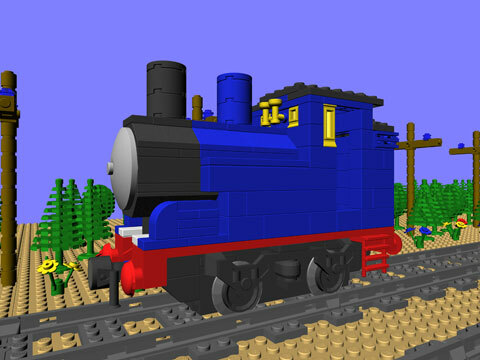 Larry Pieniazek once said: Every LEGO® Train Club ought to have a Thomas. I agree with Larry’s sentiments and CTB-3105 is my version of Thomas. Thomas has proven to be very popular at NCLTC train shows over the years and easily recognized by both adults and children. This model uses a number of pieces which may be hard to find, notably the red train chassis plate and yellow 1×1 and 1×2 (two each) classic windows. While these elements may not be readily available, you may be able to find them on BrickLink. The yellow 1×1 windows appeared in 16 sets, the yellow 1×2 window in five sets, and the red 6×16 wagon plate in three sets. Printed and bound instructions for CTB-3015 are available for purchase on Bricklink.